Guys, a topic that is kind of interesting but that you should still not bring up on a first date is how the NFL's instant-replay system is similar in some ways to the courts of appeal. Both systems use a "standard of review" under which the first call may stand even if the people reviewing it think it's wrong or might have done things differently to begin with. For example, an appellate court might think a witness's story is BS, but it will almost never reverse for that reason because it defers to the trial judge and jurors who heard the testimony in person. Instant replay has the same kind of deference built in: "A decision will be reversed only when the Referee has indisputable visual evidence available to him that warrants the change." Official Playing Rules of the National Football League, Rule 15, Art. 3, Sentence 2 (2015) (emphasis and now-outdated use of male pronoun in original). * So when the ref comes out and says, "upon further review, the call on the field stands," he (or in one case, she) might well be thinking "wow, that idiot was totally wrong but there's nothing we can do about it." I thought of this again today (I think of it every time I see an instant replay, which frankly is kind of sad) because I reversed my own first call on this incident. Not because there was indisputable visual evidence, but because of additional facts that became apparent only upon further review. That is, I actually read the words in the report. 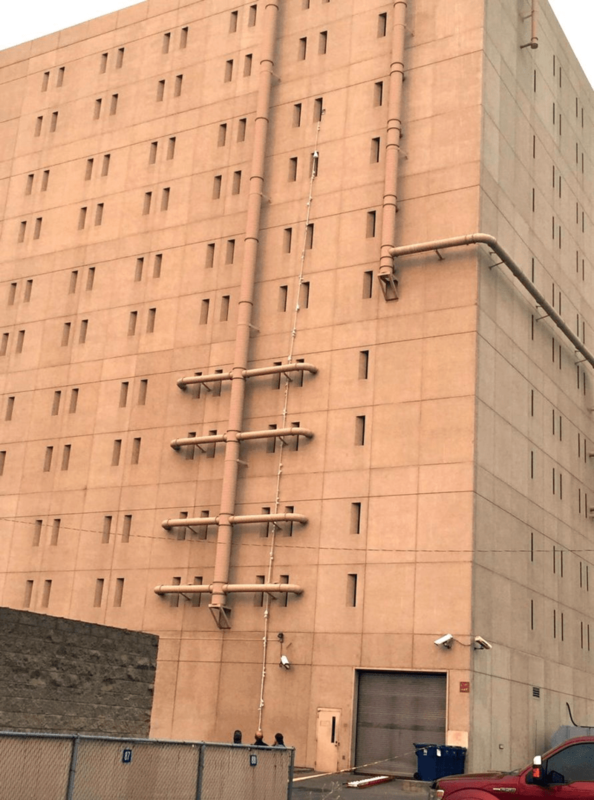 The lovely facility shown here is the Spokane County Jail, from which two inmates arguably tried to escape last week. One of them is said to be facing charges that he hired a hit man to murder his former business partner and another guy, and two people did end up dead, so he's (allegedly) either dangerous or knows people who are. Yup, the one where you tie the bedsheets together to make a rope. And as you can see if you click the larger picture, the rope actually dangles what must be close to 100 feet down the side of the building. While it's hard to be precise, I count no fewer than 24 bedsheets there, which is why I originally blew the whistle and pointed at the prison officials. Because it seems like two inmates should have at most two bedsheets (and maybe a couple of blankets), doesn't it? Not two dozen? It might not be quite that bad, because the report says that they tore the bedsheets into strips first. But it's still more than two. And the Spokane County Jail Commander (not "warden," but "jail commander"!) seemed to admit that the supplies they were given would not have been enough, because he noted that inmates also have access to a dirty-laundry bin and could have gotten more rope components there. "The accountability of the sheets, that's something we could absolutely increase," he said, as if it were the sheets' fault and a remedial sheet-training program would fix things. The call on that statement of his will stand, but upon further review, it appears the flag was thrown in error on the escape-facilitation penalty. This is because although the windows were almost 4 feet high, they were less than five inches wide. So unless the inmates had figured out a way to squeeze themselves through a space narrower than an iPhone is long, which they hadn't, they could have as many sheets as they want and still wouldn't be going anywhere. Which, in fact, they didn't. 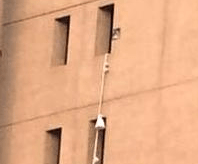 Jail staff discovered the rope at about 4:40 a.m., with the inmates of course sitting right next to it because they are each, presumably, at least five inches thick. The inmates were moved to a different section of the jail and the FBI was called in to investigate (there are federal charges pending). Neither of these things were really necessary, of course, because they aren't getting out those windows, ever, and what happened is entirely obvious. That didn't stop the FBI from reaching the wrong conclusion, though, or at least having its spokesman say that the escape "was thwarted by the good work of the staff," which it plainly wasn't. You know, upon further further review, I hate everybody involved in this story. In the NFL that might mean offsetting penalties but those aren't the rules here. *Did you know football has only 18 rules? In what is admittedly an 85-page rulebook, so yes, there are a few subparts, professor.